True adventure seekers will love the opportunity to experience one of Paragon Adventures programs while in Southern Utah. Travel just an hour outside of Parowan, Utah, for an unforgettable experience. With dozens of different options to choose from, travelers of all fitness levels and backgrounds will find something to interest them. Whether you’re looking for a fun afternoon of zip lining or a more extreme experience like deserteering, Paragon Adventures offers it all! 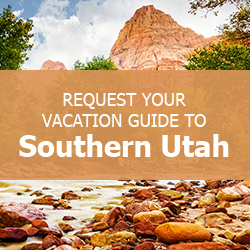 Find out more about what to do in Southern Utah by downloading our complimentary Vacation Guide. You’ll find local insight and information on the best attractions, restaurants, and things to do aside from Paragon Adventures. The top activity available through Paragon Adventures is The Quest canyoneering program. Every program is ranked with a fitness level from 1 to 5, so guests can assess their aptitude and ability for each. The Quest is ranked at a fitness level of 1, making it an excellent activity for families. It’s also suitable for large groups and easily customizable based on participants’ skills and experience. During this 3-5 hour tour, you’ll experience hiking, rocking climbing, and zip lining through a desert canyon. Another one of the most popular outings is the Mojave Canyon Zip Line Tour. Also ranked for fitness level 1, this activity allows you to sail over a 600’ canyon on a 2400’ long zip line! Get an unparalleled view of the Mojave Desert as you glide through the air on this 2-3 hour tour. The third most popular activity is the half day canyoneering intro, designed specifically for first time canyoneers. Though this is also a fitness level 1, it involves technical instruction and obstacles better suited for adults. Learn the basics of rappelling and how to navigate through a canyon system with obstructions like water pools and boulders. If you consider yourself a very active person with experience in outdoor adventuring, you should try one of Paragon Adventures more complex tours. Step outside your comfort zone and sign up for a wild caving program! For those who have never hiked underground, choose the Cave Sample tour. This adventure takes you 200 feet below the surface with a combination of downward hiking and rappelling. An optional route allows you to squeeze through tunnels to get to the awe-inspiring Great Room. Though the Cave Traverse program is also ideal for first timers, you will encounter more challenges along this route. Wander by huge gypsum crystals, pass through small, tight passages, and crawl under obstacles to reach your final destination. Then, rappel 170 feet into the dark to explore more rooms and secret passages. Paragon Adventures offers a long list of different, customizable tours. For a full lineup of their programs, check out the website. If you’re traveling alone, be sure to read up on their Solo Traveler activities, including multiple canyoneering, rock climbing, private guides, and mountain biking adventures. Trek through some of the most beautiful, secluded trails on one of the four Adventure Hikes. Or, ride over rust-red sand dunes on the ATV/Zip line combo tour. Whatever activity you choose, Paragon Adventures will make sure you have the experience of a lifetime! After a day of exploring with Paragon Adventures, come back and relax in one of our Family Time Vacation Rentals in Parowan, Utah. If you’re traveling with a large group, inquire about our Red Canyon Lodge. Spacious enough to sleep up to 22 guests, this property is close to other attractions like Brian Head Resort and the Parowan Gap. Smaller groups can opt for this comfy Parowan home near Zion National Park. Browse our full catalog of Southern Utah vacation rentals, and start planning your getaway!